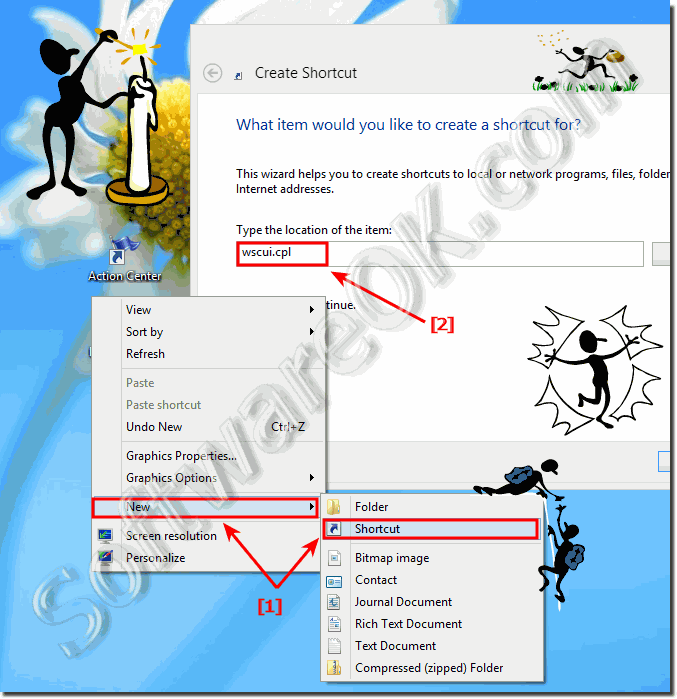 Create Action Center Desktop Shortcut for Windows 8.1/8! It's easy to create Action Center Desktop Shortcut in Windows 8.1, 8 or Windows 10. This solution is also for Windows Server 2012 and 2008! 1.) ... Creating the Action Center desktop shortcut for Windows 8.1 (7, 8) and Server 2008/2012! 2.) ... What is the Action Center in Windows 8 and 8.1 and information! 1.) Creating the Action Center desktop shortcut for Windows 8.1 (7, 8) and Server 2008/2012! "New" and "Shortcut" (... see Image-1 Arrow-1) and use the command wscui.cpl! Please click the button "Next" and use for the name Action-Center! PS: To see the Windows 8.1 desktop, simply press the keyboard shortcut [Windows+D]! Click on the Action-Center Windows 8 Desktop shortcut to see (open) the Action-Center! (Image-1) Action Center Desktop Shortcut for Windows 8.1 and 8! 2.) What is the Action Center in Windows 8 and 8.1 and information! Action Center is a central place to view notifications and take actions that can help keep Windows running smoothly. If Windows finds any problems with your hardware or software, this is where you'll get important messages about security and maintenance that need your attention. 2. View and change the status of the Windows virus and spyware protection! 3. Windows updates status and customization! 4. Information if a new driver is available! 5. Windows 8.1/8 File History! ... and match more ! (Image-2) Show eg. Open Action Center in Windows 8.1 or 8! Other Win 8.1/8 Action Center items! Checks info coming from the Internet or a network, and then either blocks it or allows it to pass through your firewall to your PC. Gathers the latest security and PC updates from Microsoft via the Internet. Detects whether your virus software is turned on and up to date. Detects whether your spyware protection is turned on and up to date. Checks to make sure that your security settings are working correctly. Informs you when a app makes a change that requires administrator permissions. Helps protect your PC by warning you if a downloaded file is known to be malware or has an unknown reputation. Helps protect the overall security of the network (mostly used on corporate networks). Informs you about whether you've activated your copy of Windows. Checks for solutions to software or hardware crashes that happen on your PC. Runs maintenance tasks to keep your PC running smoothly. Checks that a homegroup is working correctly (if available). Checks to make sure your PC is saving copies of your files so you can get them back if the originals are lost or damaged. Checks to make sure the file system is working correctly and is free of errors. Checks for whether you need to install additional software for devices to run correctly. 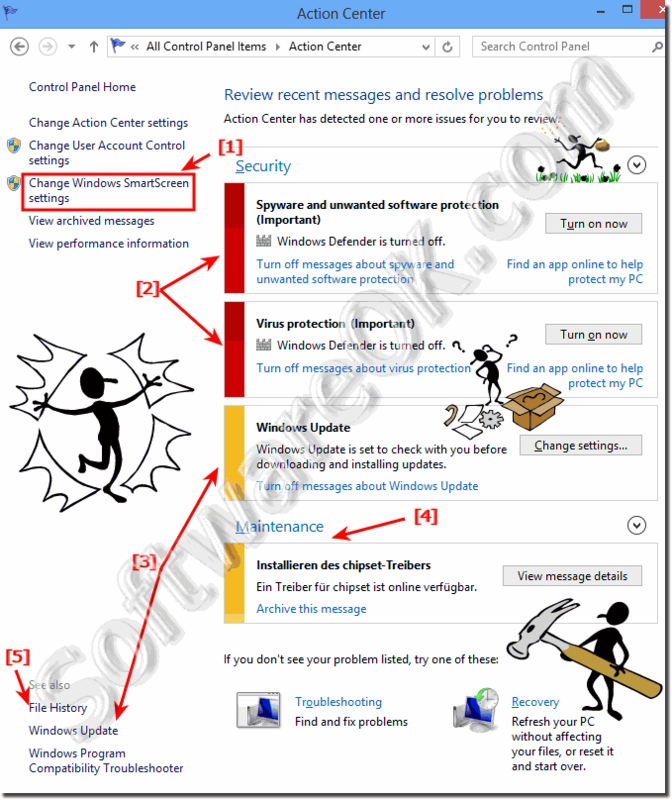 Windows-8 - FAQ-140: Create Action Center Desktop Shortcut for Windows 8.1/8! How to customize Windows Smart Screen in Win 8.1 and 8 (turn-off, disable)! Change settings in Win 8.1/8 when to be notified about changes on your computer! Screensaver to display, pictures folder in windows 8.1 / 10? System center create desktop shortcut? Disable Action Center Windows 8?